Is It Harder To Sue For Defamation In Florida If You Are A Public Figure? Public figure versus private citizen distinction under Florida law. In Florida, gossiping and spreading rumors, or just saying bad things about someone else can get you sued. If you speak it (slander) or you write it (libel), under Florida law you can be sued for defamation (See Chapter 836 of Florida Statutes). Defamation can happen anywhere, in the newspaper, around campus or even at work. However these days, defamation happens more and more online due to people sharing information via social media (Twitter, Facebook, Snapchat, YouTube, etc.). This is known as “cyber defamation” or “online defamation” and a single 140 character tweet can result in a serious harm to an individual; meaning, it is not necessarily the length of the wrongful statement but it is the reach and impact that counts. What Are The 4 Elements You Have To Prove To Prevail In A Defamation Claim In Florida? 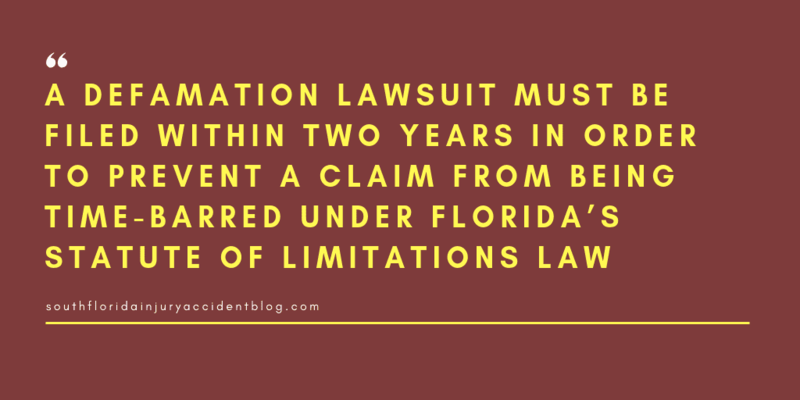 The first thing to know, and a commonly asked question, is a defamation lawsuit must be filed within two years in order to prevent a claim from being time-barred under Florida’s Statute of Limitations law. See – Florida Statute 95.11(4)(g). 4. That the falsity of the statement caused injury to you. See, Border Collie Rescue, Inc. v. Ryan, 418 F. Supp. 2d 1330, 1348 (M.D. Fla. 2006). Notice the first and last elements; they include the word false. If what was said by the defendant was true then there is no defamation. Meaning, truth is a defense to a defamation claim. See, Razner v. Wellington Reg’l Med. Ctr., Inc., 837 So. 2d 437, 443 (Fla. 4th DCA 2002). Stated another way, it is unlikely that anyone will be ordered to pay damages for telling the truth, no matter how harmful a statement might be. What Type Of Damages Are Recoverable For Defamation? What does that mean? Victims can obviously collect for their embarrassment and mental anguish but they can also be compensated for any harm that results from all of the consequences that “reasonably and naturally flow” from the defamatory statements. Briggs v. Brown, 55 Fla. 417, 46 So. 325 (1908). Things like harm to someone’s personal or business reputation, damage to someone’s credit, loss of work or a job, or loss in business profits, can form the basis for a defamation damage award. See Briggs and Miami Herald Pub. Co. v. Brown, 66 So. 2d 679 (Fla. 1953). Do Celebrities And Public Figures Have Different Rights? So why don’t we see more lawsuits here in Florida, brought by celebrities against people who say bad things about them in tweets or YouTube comments? It’s easy enough to think about lots of horrible things that are written or said every single day by lots of people about celebrities like Kim Kardashian or Charlie Sheen. Why don’t they sue for defamation? In Florida, someone who is a celebrity is considered to be a “public figure” under the law. As a public figure, they have to prove more than the four things (elements) listed above for a defamation lawsuit. It is much harder for a public figure to win a defamation case because they have a bigger burden of proof: they have more evidence that they must provide. In Florida, celebrities like Reality TV stars are not the only people who are considered to be a public figure. Those working in a government job might qualify here, too. What does this mean? You don’t have to be a celebrity to be a public figure in Florida. Even though the patrol cop was not in the public eye, and no one ever asked for his autograph or to take their photo with him, he would be held to the same legal standard as a movie star or a famous rock and roll singer. Back in the mid-1980s, a man named George Russell was pulled over and then arrested for driving drunk by officer Jeffrey Smith of the City of St. Petersburg Police Department. Mr. Russell didn’t fight the DWI charge; he pled “nolo contendere” to the judge when he was arraigned. However, as he pled no contest to the drunk driving charge, Russell also complained about how the arrest went down. Mr. Russell told the judge that the police officer used unnecessary force. The judge’s response? File a complaint with the police department. So Russell did exactly that. And more. He wrote four letters: one to the police chief; one to the DWI court judge; one to his friend, Judge Shingler; and one to Police Officer Smith. Not long after that, Police Officer Smith was up for a promotion. He didn’t get it. So he sued Russell for defamation. Smith believed that Russell’s complaints in those four letters had blocked him from that new job he was hoping to get. He thought he had been harmed by Russell’s written statements about “unnecessary force,” and now Smith argued the statements were libelous and he wanted defamation damages to be paid to him by Mr. Russell. Russell fought back. At trial, Russell’s lawyer argued to the judge that as a member of the St. Petersburg Police Department, Smith was as “public official.” Using the federal case of the New York Times Co. v. Sullivan case as his example, the lawyer urged that the Florida police officer was, in fact, a “public figure” who needed to show evidence of actual malice on the part of George Russell before he could win his defamation lawsuit. It was a heated contest, and the case made its way from the trial court level all the way to the highest court in the state, the Florida Supreme Court. There, the Florida Supreme Court agreed with George Russell. The result? Police Officer Smith lost his lawsuit as well as his promotion. Why? According to the Supreme Court of Florida, “public officials” are government employees who appear to the public to have substantial responsibility for, or control over, the conduct of governmental affairs. They are more than famous people. This means that they have to provide evidence through either the testimony of witnesses or through documents (or a combination of both) that the defendant knew that what he was saying (slander) or he was writing (libel) was false when the statements were made — that he knew it was not true — or that he had a “reckless disregard” for whether they were true or not. This is the New York Times actual malice standard, as explained and relied upon by the Florida Supreme Court. What is a “reckless disregard” for the truth? It must be shown with evidence that the defendant had “serious doubts” about how true the statements were and went ahead and made them anyway. If the person making the statements KNOWS that they are false, and makes them anyway, then it is actionable. They are lying and they know it, and what they say, or write, hurts someone. It is “express malice” under Florida law; express malice is defined as “… ill will, hostility, and evil intention to injure and defame.” Montgomery v. Knox, 23 Fla. 595, 3 So. 211 (1887), cited by Demby v. English, 667 So.2d 350, 353 (Fla. 1st DCA 1995). Simply put, when you are a celebrity or media star you are considered a “public figure” under Florida defamation law. However, others may also be considered public figures, including those who have government jobs where they have significant responsibility or control over government affairs – like a police officer on the job, pulling over suspected drunk drivers. In Florida, someone who is not a public figure is known as a private figure (when it comes to a defamation claim). Private figures don’t have as big of an evidence burden to meet in order to win their case. Private figures must have evidence that the person who made the alleged defamatory statements did so in a way that was negligent; were their statements false? Public figures have to go farther in their proof: they have to show more than negligence (mistake) to win a defamation claim. They must prove malice. Read: How Do You Recover Emotional Distress Damages in Florida? If you have been harmed by defamatory statements made by someone else, either spoken or in writing, then you may have a legal claim for damages against them for the losses to your business or your reputation, etc., that has resulted from what they stated. Defamation claims are all different, and each case must be analyzed on its own individual circumstances. If you are a public figure under Florida law, you can still win a case for damages but you have to gather more evidence than others might need in order to do so. Having an experienced Florida personal injury lawyer to help you in these situations can be invaluable to getting justice and repairing the harm, both emotional and financial, that you may have suffered. A good piece of advice if you believe you have a defamation claim is to at least speak with an experienced personal injury lawyer before you file a claim to learn about some of the issues that can arise with these claims, including the type of evidence needed to prove a claim and the type and amount of damages you can recover. Most personal injury lawyers, like Alan Sackrin, will offer a free initial consultation (over the phone or in person) to answer your questions. What Damages Are Recoverable In A Defamation of Character Claim? Can You Collect Punitive Damages for Defamation of Character?